What is a Mom2Mom Sale? COST: $20 per table. Each space 8 feet x 3.5 feet. We will provide a 6 x 2 table and two chairs. Please request special area if you will not need a table or if you are bringing in a rack. No items are to be brought to the school prior to Friday, March 1st at 7:00pm. APPLICATION DUE DATES: We will accept applications until Friday, February 22nd or until tables have been filled. You do not need to have a table to sell Large items. Applications and table rentals are being accepted on a FIRST COME/FIRST SERVE BASIS. Upon receipt of your application and check/money order, a confirmation will be emails to you. 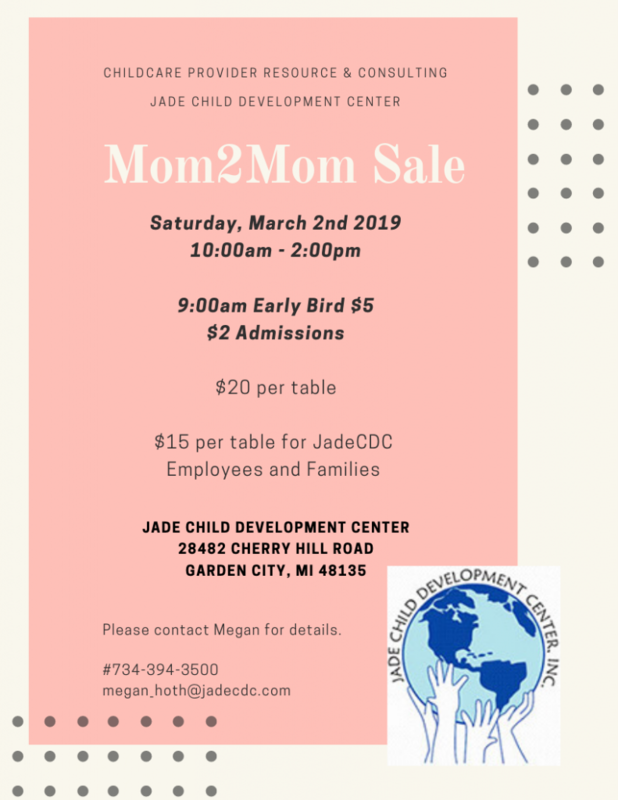 JADECDC EMPLOYEES AND FAMILIES: If you are currently employed or enrolled at Jade Child Development Center, the cost of a table if $15. VENDORS: We will be accepting one vendor per company. Vendor spaces go quickly. LARGE ITEMS/$10 FOR 10 ITEMS: Large items will be sold for you in the LARGE ITEMS AREA. This area will be located in the first room to the left in the front of the building. Please note that the fee is non-refundable, and the cost is $10 even if you have less then 10 items. A tally form along with tags will be emailed to you prior to the sale. –You may not have large items at tables as they pose trip hazard. Items such as high chairs, car seats, bouncy seats. If such items are found at tables, you will be required to place in the large item room for a fee of $10. Please do not arrive before 6:00pm, you will not be able to set up prior to 6:00pm. No exceptions. Large items are to be dropped off and checked in at the Large Item check in. Please do not arrive before 7:00am. Large items are to be dropped off and checked in at Large Item check in. Tables not set up by 8:30am will be forfeited. It is your responsibility to provide bank change, bags, etc. for sales. Additional information will be sent to you in an email including set-up and large item information, and additional key points.